What do you do when you feel tired or overwhelmed? Do you power through? What do you do when you feel tired or overwhelmed? Do you power through? Or do you take some time off? In the past, I thought that you should always power through — no matter what. Now, I still think that way when it comes to life in general. You can’t quit taking care of yourself and your family. A sense of responsibility is one of the most powerful motivators in life. But I’m not talking about a lack of motivation here. I’m talking about taking time off work. But there’s still a massive taboo on taking time off. Some people think it’s for losers. Others think it’s about escaping your work. Good point, smart a**. 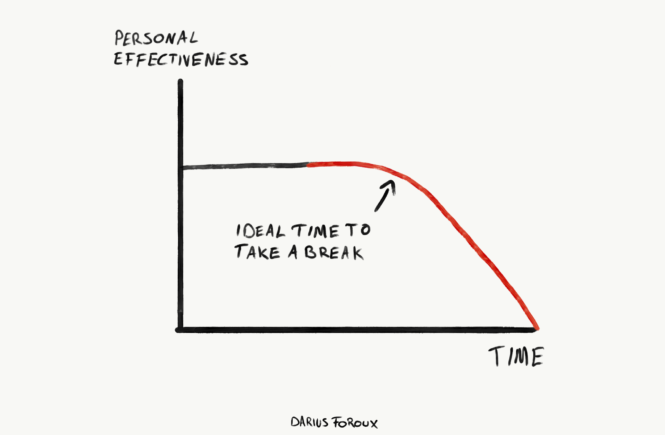 Here’s why time off actually improves your work and life. But as always, short-term thinking harms your long-term development and growth. What happens when you power through work and burn yourself out? In most instances, your results suffer, and you become less productive. In some cases, you even become depressed — which will set you back even longer. Bad strategy. Instead, it’s much better to prevent burn-out or a decrease in your overall work performance. When you are in execution mode, you can work for hours, days or months in a row. In fact, I know people who’ve been in execution mode for years. They never took time off to reflect or think about their work. Result? A midlife crisis. Or, young folks who experience a quarter-life crisis. That’s what you get when you put your head down and execute without thinking. You might get results. But are those results what you want? When you take time off work, you have more inner-conversations. But when you execute, you don’t. That’s one of the most important benefits of doing nothing. Sure, you might fall behind on work. But who cares? Would you rather go through your career with tunnel vision? I need at least ten days off to reflect seriously. For the first five days, I’m still somewhere between execution and thinking mode. It’s hard to switch to thinking and doing nothing if you’re used to doing work. But I always learn new things about myself after a more extended break. I tend to read a lot. Over the past two weeks, I’ve read five books. But I didn’t write at all. Also, I journaled very little. Just some reading, watching movies, documentaries, hanging out with friends, talking, daydreaming. That kind of stuff. Neither does it cost much. But the return is enormous. Now, I feel better, have more energy, and I’m excited to get back to work. That’s also the next lesson I learned. Your brain does a lot of things you’re not aware of. One thing that happens unconsciously is the processing of ideas by our brain. We’ve all had ideas that never materialized, right? How many people have you met who claimed to have had the idea for Facebook, Instagram, or any other type of new thing? I once met a guy who claimed to have come up with the idea of making e-bikes. Did he do something with it? No. He now buys garbage on Alibaba and sells it to businesses, door-to-door. We all have ideas. Not only business ideas. All those ideas are great. But what are you going to do with them? I’m not even talking about execution. All ideas require processing. Are the ideas any good? Do I really want to do those things? Again, that’s a thinking process. When you go from idea to execution, without processing, you often waste your time in hindsight. Of course, you can never entirely prevent that. But by taking the time to process your ideas, you can prevent your future self a lot of pain, worry, and even money. What is art? Anything that makes you think. A good song, movie, painting, book, poem, article, picture, sculpture, you name it. Anything can be art. There’s no authority that declares what art is and what is not. I get a lot of my inspiration from art. I can’t imagine what life would be without it. Well, there is art on that too. Just read Fahrenheit 451 or watch the movie Equilibrium. The best thing about art is that it improves your mood. And when you’re in a good mood, you’re happier. Just don’t consume useless junk. Start with the classics. Listen to Bob Dylan, Marvin Gaye, Whitney Houston. Watch movies by Alfred Hitchcock, Francis Ford Coppola. Read Ernest Hemingway, Harper Lee, Ralph Ellison. Go to the British Museum. Study Andy Warhol. Like millions of other people, you’ll be inspired by their work. And that will enrich your life. Modern day life almost forces you to identify yourself with work. But you are not your job. You are your family, friends, hobby’s, passion, and then finally, you also have a job. And yes, work is important. But so are the other things. So never neglect the other important things in your life. Cultivate the relationships you have with your family and close friends. Do things together. Go on a family holiday. Go mountain biking with your friends. Show some initiative. If no one in your family or group of friends takes action, why aren’t you? By investing time in your relationships, you form group memories. That will only strengthen your relationships. But also focus on yourself. What are your hobbies? What’s something you want to learn more about? What did you dream of doing? Do those things. 5. Resting Gets Boring. Quick. There’s a reason humans work. We’re built to make things. I believe that the purpose of life is to be useful. Making yourself useful ultimately leads to a meaningful life that satisfies all your human needs. That’s why too much rest will make us restless. My mother always told me that too much of a good thing becomes a bad thing. She told me that when I wanted to hang out with my friends all the time and when I had my first girlfriend. It’s true. Too much rest, like work, is not good. Our bodies and minds are made to use. Hence, the final lesson I learned from doing nothing is this: After rest comes work. And what comes after work? If you answered “more work,” you didn’t get the point. You probably need some rest. If you want to hear more thoughts on why taking time off improves your life; listen to my podcast episode about it. Join 29,951 other readers who get my newsletter. I’ll also send you my eBook ‘How To Go From Procrastinate Hero To Procrastinate Zero’ for free. Darius Foroux is an author, entrepreneur, and podcaster. He writes at DariusForoux.com, where he shares ideas for living a productive life.